You are currently browsing articles tagged Cuban. 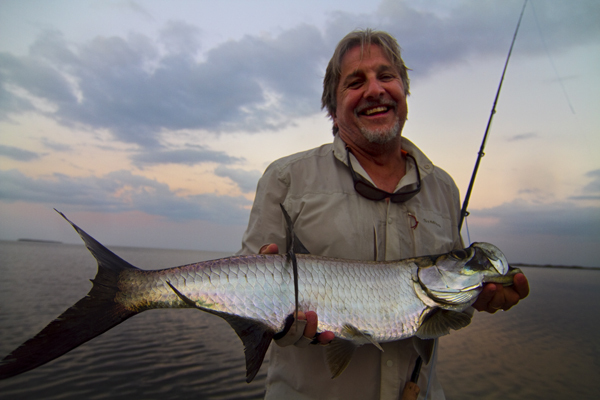 Fletch with the first of his three tarpon. Photo by David Lansing. There are two ways to go when you don’t get something you want: Either it becomes an obsession or you just let go of it and stop worrying about it. That’s the way I was about catching a tarpon. For three years I had tried to catch a fish that Saltwater Sportsman magazine calls “one of the most storied gamefish in the world” and for three years I came up buckus. It’s not that I didn’t see any tarpon; I did, a hundred or more. It’s not that I couldn’t hook one on a fly; I did, by the dozens. I just couldn’t get one to the boat. Known for their ability to throw hooks because their bony mouths are like porcelain, there’s a real trick to bringing in a fish that can easily run 50 pounds or larger. When they come out of the water, thrashing their heads from side to side, you have to do a technique known as a “bow to the silver king,” which involves leaning toward the fish and putting your pole tip towards the water. This creates a slack in the line that helps keep the fish from throwing the hook. And the more you hook but don’t bring to the boat, the more an obsession it becomes. The last time we were in the Jardines, two years ago, I truly was an obsessed fisherman. And so were the guides. Everyone else on the boat had caught at least one tarpon (Greg, who had never even caught a bonefish before that trip, had caught five or six). Except for me. So as the time began to run out on our trip, all the guides made it a point to take me to the best tarpon places and do everything they could to help me bring one in. One afternoon I hooked and lost six tarpon in a row. Each time the fish threw the hook or broke the line, I’d stomp my feet and scream blasphemies towards the heavens. It was terribly frustrating. And then this year I just decided I didn’t give a damn. I was not going to spend the entire week chasing this elusive fish. In fact, I made it clear to the guides that I didn’t care if we ever even went fishing for tarpon. I was perfectly content to chase bonefish or snappers or whatever we came across. But you know, these guides take their responsibilities very, very seriously. It’s like they feel they lose a little face if their clients can bring in a tarpon or two. So it was apparent to me all week long that the guides were more interested in me catching a tarpon than I was. 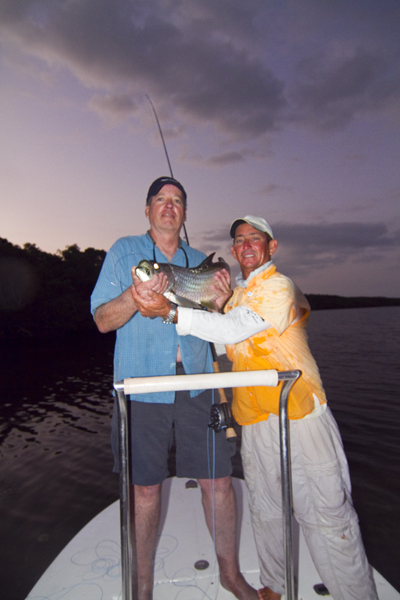 Maybe they had a bet on it—the first guide to help Mr. David bring a tarpon to the boat. Who knows. Yesterday afternoon was probably the most perfect day of fishing I’ve ever had in the Jardines, and that’s saying a lot. I was teamed up with Fletch with Coki as our guide. Now much has been made of Keko’s ability to find fish in the Jardines but Coki is probably just as good if not better at knowing not only where to find bonefish and tarpon and even permit, but also in knowing where the big ones are. The only problem with Coki is that he has no patience for bad fishing. One morning he’d taken Fletch to a spot where a very large permit—which none of us has ever caught—was right in front of him. Coki said it was the biggest permit he had ever seen (and he’s helped his clients catch 98 of them). He told Fletch exactly what to do—where to put the fly, how to strip it, how to set the hook. And then he told him to cast. And Fletch screwed it up somehow and lost the permit. In Spanish, Coki called him an idiot. But he couldn’t let it end there. All day long he kept bringing it up—how big this fish was, how Fletch should have caught it. At one point, at a loss for words, he simply held up his thumb and forefinger as if it were a gun, pretended to shoot Fletch, and then turned the faux-gun to his temple and shot himself. That’s how bad Coki felt about not getting that permit. I understood perfectly. I just hoped he did as well. True to his word, Coki was very patient with us. But he also got us into some spectacular fishing. And then very late in the afternoon, he pointed the skiff due east and we bumped over the water to a long, low stretch of islands and mangroves that we had never seen before. As the sun was getting low in the sky, we fished for bones and brought in one after another. Then, at twilight, Coki moved the skiff even farther down the island and killed the engine about twenty feet off an inlet leading into the mangroves. Coki and me with my first tarpon--ever. Photo by Chris Fletcher. “Big tarpon here,” he said. It was tricky fishing. You had to drop the fly in a little pool surrounded on three sides by mangroves and your margin of error was only three or four feet. If the wind carried the fly or you didn’t release it just right, you’d end up getting hooked up in the branches of the trees. But Fletch was casting extraordinarily well and time after time he was able to drop the fly right where Coki directed. Within minutes he’d hooked a large tarpon and lost it. But rather than reeling in and starting over, Coki told him to just lift the fly straight out of the water and drop it down in the same spot. Which Fletch did. And he immediately hooked another tarpon. This one he was able to get to the boat. Our first tarpon of the trip. Then Coki told me to get up there. So I cast and hooked what we thought was a very large, very powerful bonefish. I fought it for almost ten minutes, sweat pouring off my head. When we got it to the boat, we saw that it was a good size red snapper. Maybe 15 pounds. A beautiful fish and one that we would keep for dinner. Fletch got back on the nose of skiff and almost immediately caught his second tarpon. This one was even bigger than the first. At this point there was almost no daylight left and we knew we had at least a 30 minute ride ahead of us to get back to the Avalon I. I thought we were finished. But Coki insisted I get back up there. In semi-darkness, I cast where Coki instructed and on my second or third throw, hooked a tarpon. He lunged out of the water four or five feet into the air and I pushed the pole away from, giving the line slack. Three, four, five times the tarpon came out of the water, shaking his head like a mad dog, desperately trying to throw the hook. Each time I pushed the pole down. And eventually got him to the boat. My first tarpon. Ever. At this point, Fletch was so excited about the tarpon honey hole we’d found that he begged Coki to let him make just one more cast before we headed back. Coki said, Okay. One cast. And wouldn’t you know it that on the last cast of what had already been a spectacular day, Fletch caught his third tarpon of the afternoon. Unbelievable.